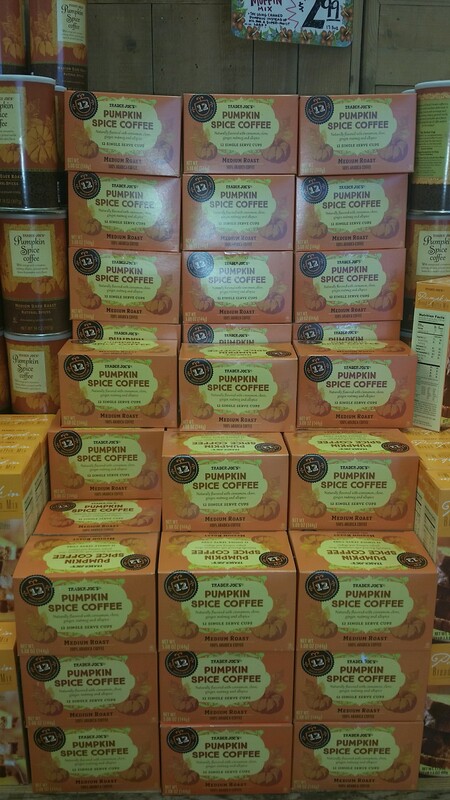 Fall is my most favorite time of the year for several reasons! I always love how the seasons change and it starts to cool off and I can enjoy the cool crisp breeze and have the ability to wear jeans and a sweater. 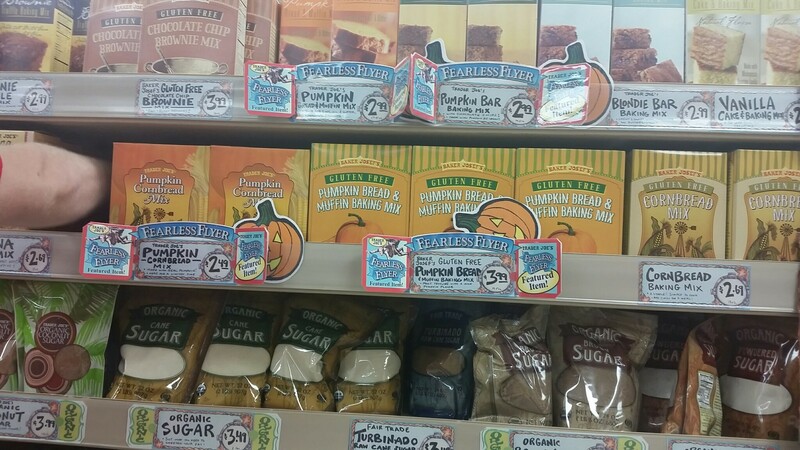 I also love the many varieties of pumpkin goodies and holiday treats that come about at this time of year! 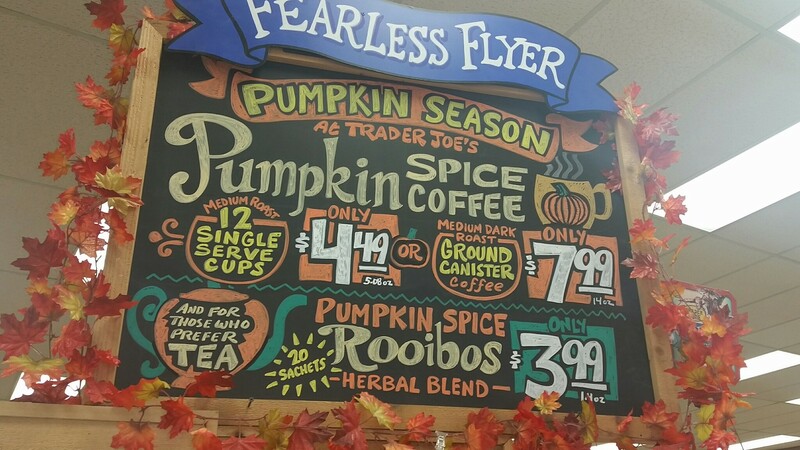 While recently visiting one of my favorite grocery stores that is always filled with a variety of amazing items, Trader Joe’s, of course, I marveled at all of the fabulous pumpkin products available. 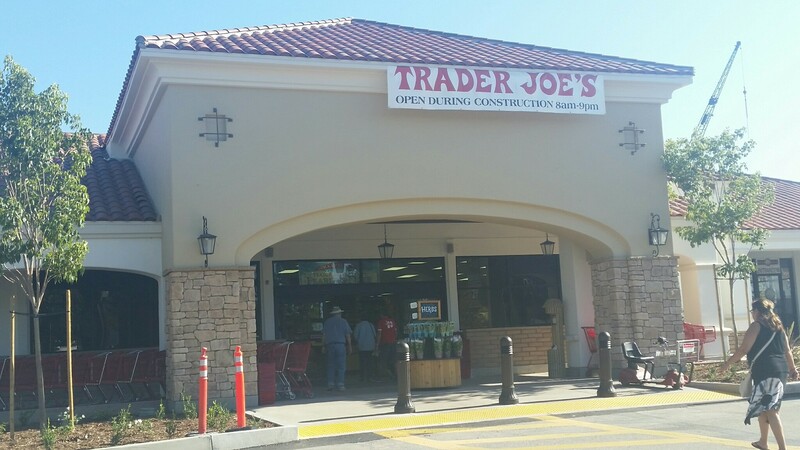 Every year when I visit the store around this time, I always think I am going to make an article about all of the seasonal goodies they have and this year I finally was 100% inspired and had an opening in my publication schedule, so here goes…Welcome to Trader Joe’s – All Things Pumpkin! 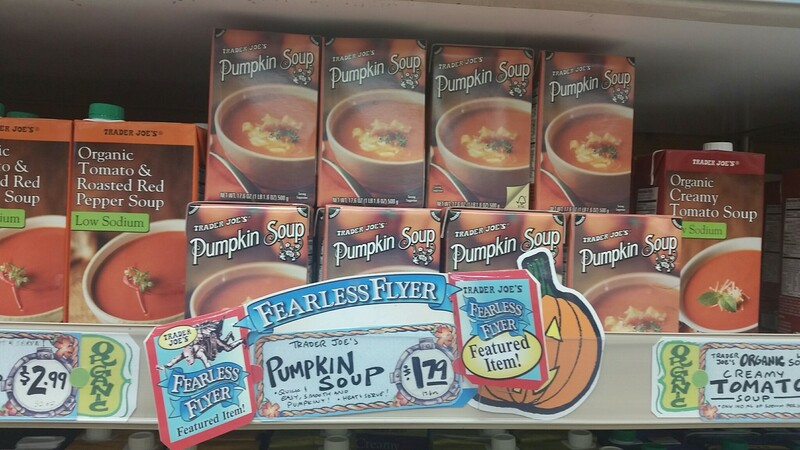 Every year I love to purchase all of the delicious squashes and pumpkins they have at Trader Joe’s. 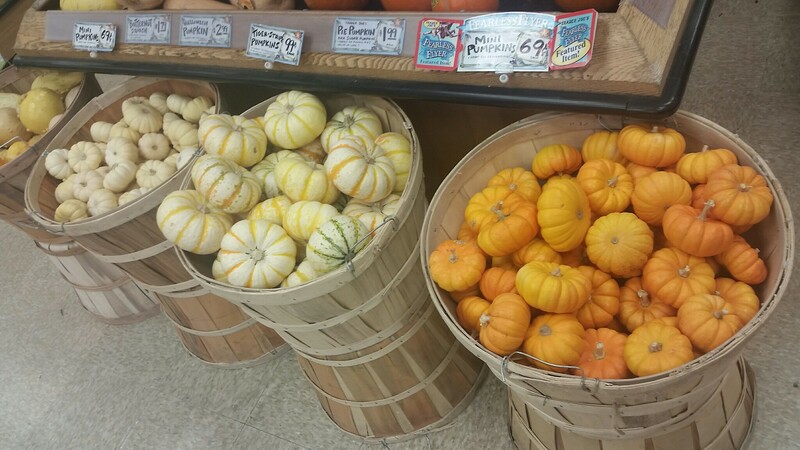 Two of my faves are the Kabocha pumpkin and the acorn squash. 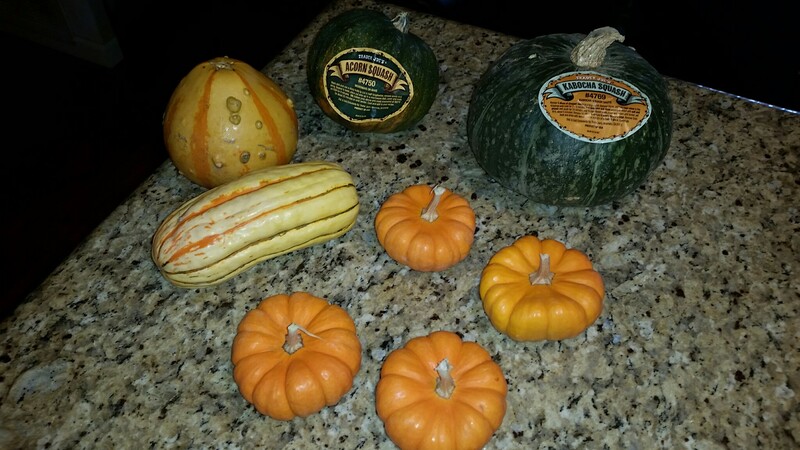 I also like to get a variety of mini pumpkins and gourds for my students & I just for fun! This year my mini pumpkin on my desk has a cat face painted on him. 🙂 Check him out in my photos below! 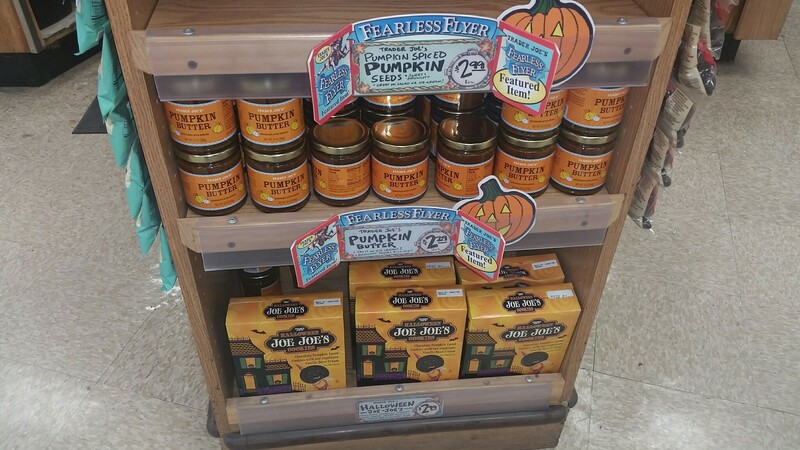 As I trekked through my local Trader Joe’s store last week, the first item I picked up was my favorite that I must get every year! 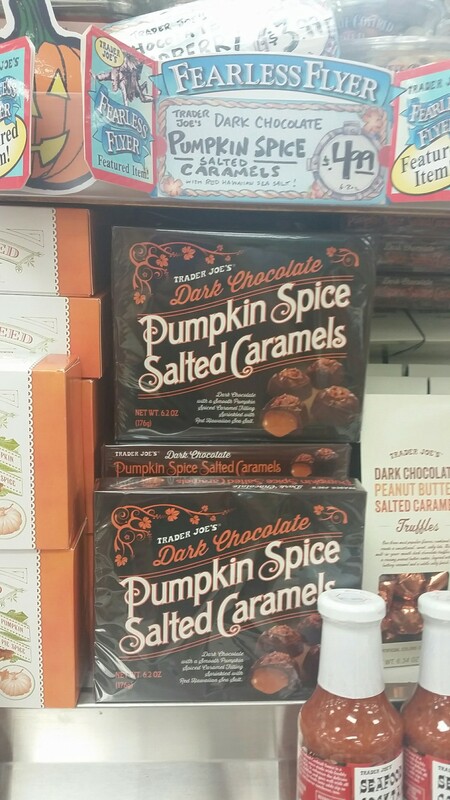 It was my Pumpkin Spice salted caramel chocolates! If you have not tried these yet, you are missing out! 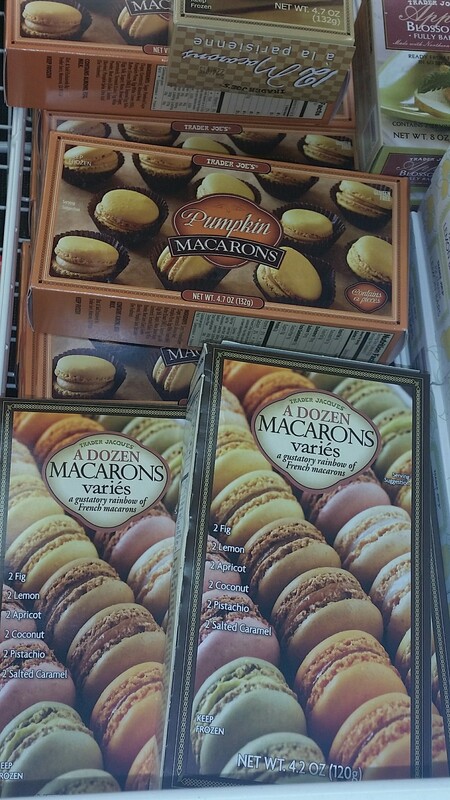 They are truly one of the best items at this time of year & I savor the flavor of that box and make it last! 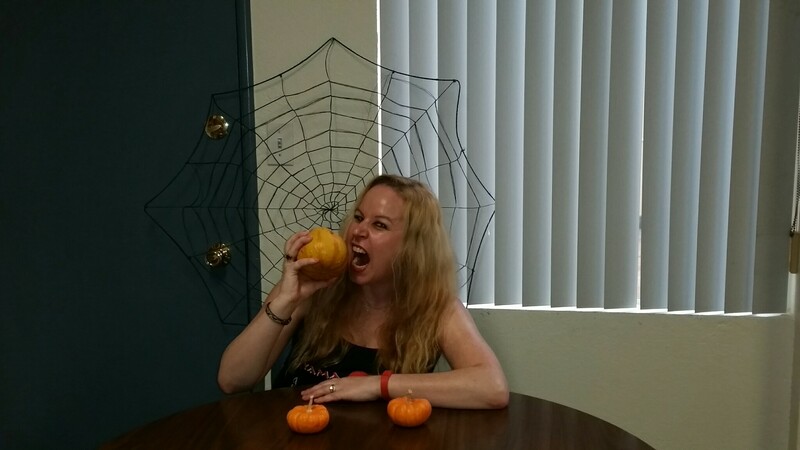 Usually at the end of the season, though I am all pumpkined out! 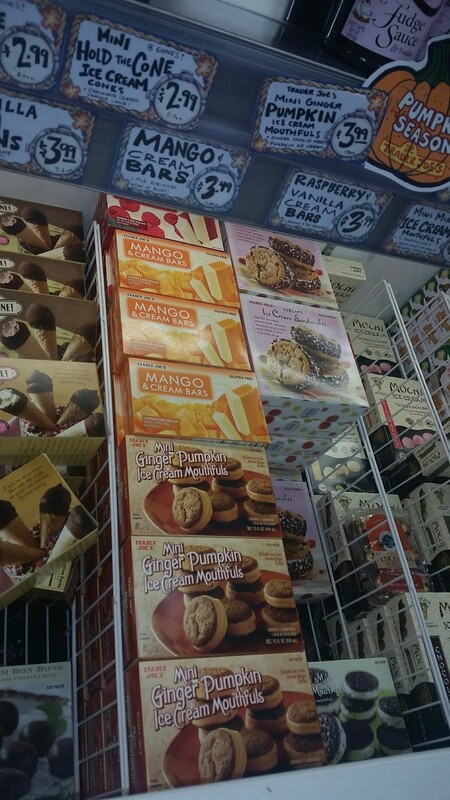 🙂 Here are some of the items I saw last week at my local Trader Joe’s with my commentary of likes, unknowns and dislikes. 🙂 Happy Shopping! 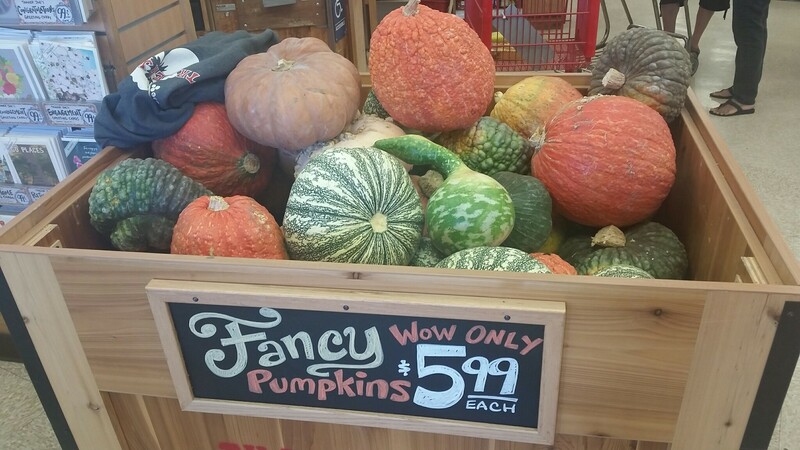 Fancy Pumpkins are pretty awesome at TJ’s this year…a variety of fun styles for only $5.99 each! 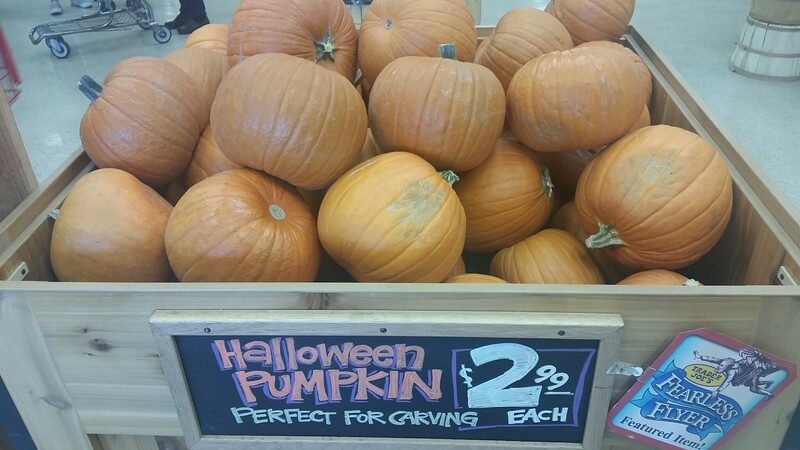 Halloween Pumpkins for carving are a decent price at only $2.99. 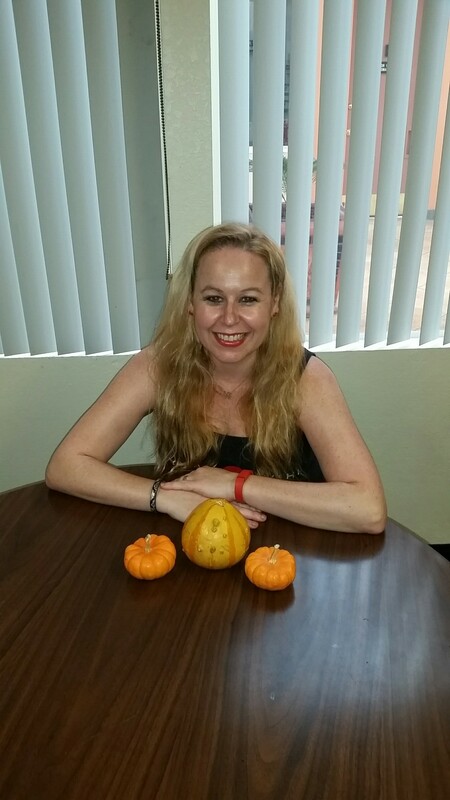 Mini Pumpkin varieties are always fun to make your place of work festive! 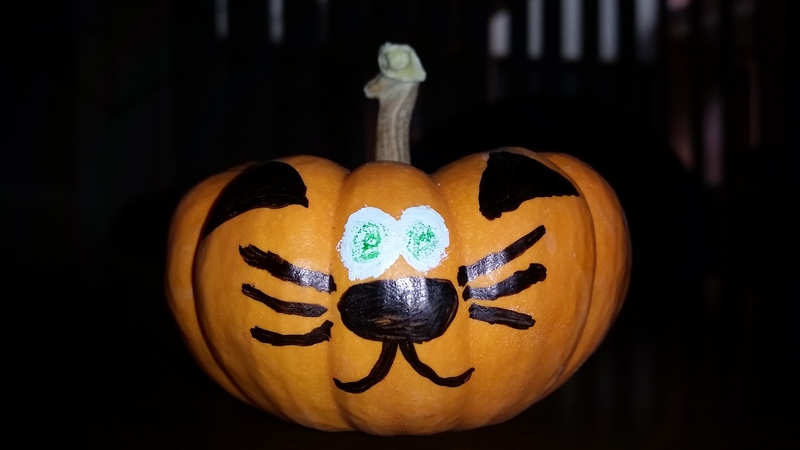 See my little cat pumpkin I decorate for myself that is on my desk at school in photo here. 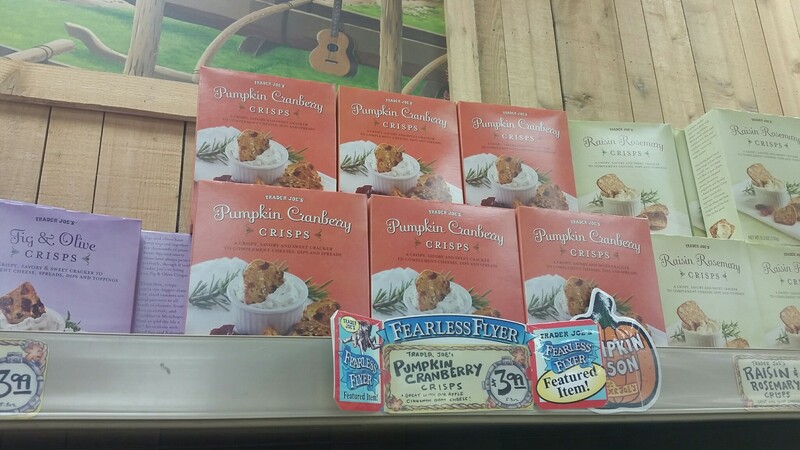 Pumpkin Cranberry Crisps – I have not tried and did not get too excited. 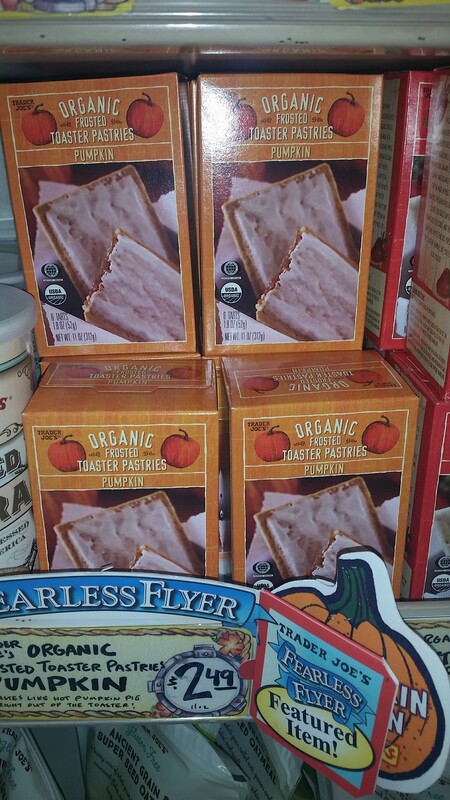 Pumpkin Toaster Pastries – I have not tried, but they sound good. 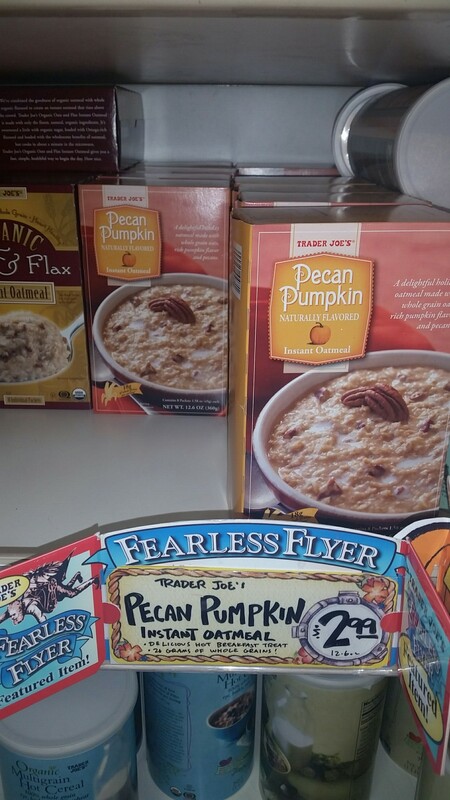 Pecan Pumpkin Instant Oatmeal – Love love love this one!! This is my guilty pleasure one morning out of my week because I normally only eat plain oatmeal with an equal packet and fresh fruit to stay healthy and not eat too much sugar, but this stuff is so good! Sugar is not too high on this item in comparison to other flavored oatmeal and the flavor is absolutely delicious! I wish I could eat this one daily, but I would probably get sick of it quickly. 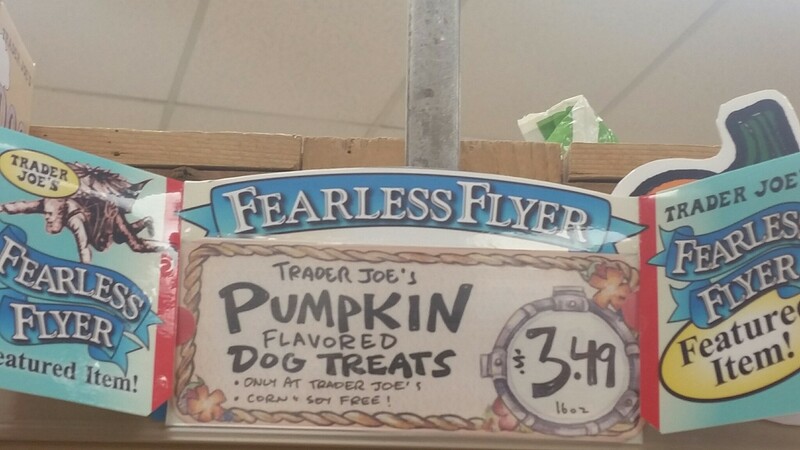 Pumpkin Dog treats – I have not personally tried these, but I am assuming they are awesome and the dogs love them because they were sold out! Pumpkin Soup – I am going to have to go back for this one…my hubby loved the idea of this one after I told him about it. Pumpkin fruit bars – I have no0t tried, but they look healthy and tasty. 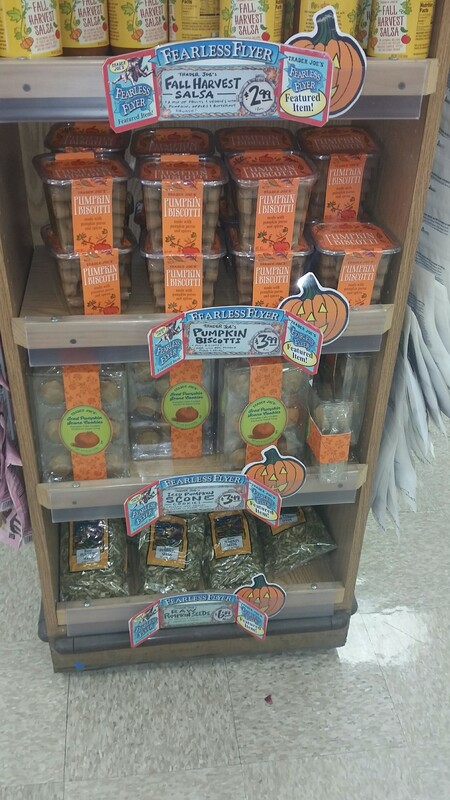 Pumpkin Biscotti, Scones, and seeds – I would try the biscotti! Definitely they are a purchase for next time. I would also love to try the scones. 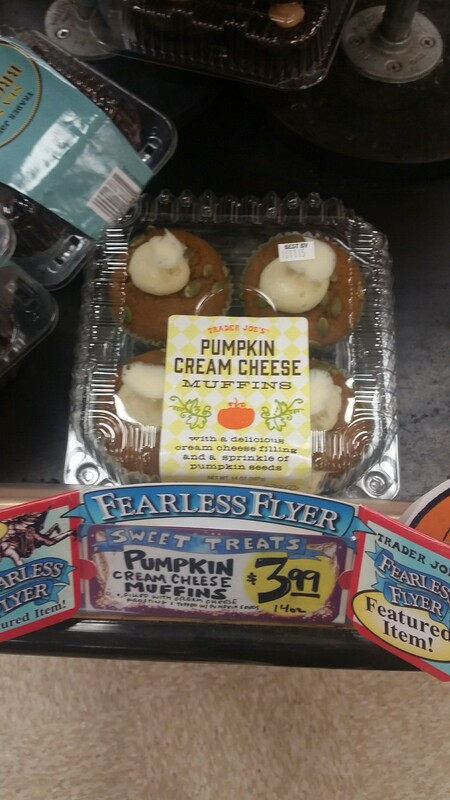 My coworkers picked up some pumpkin scones from our local grocery store and they were so tasty, so I am sure these will be decadent. 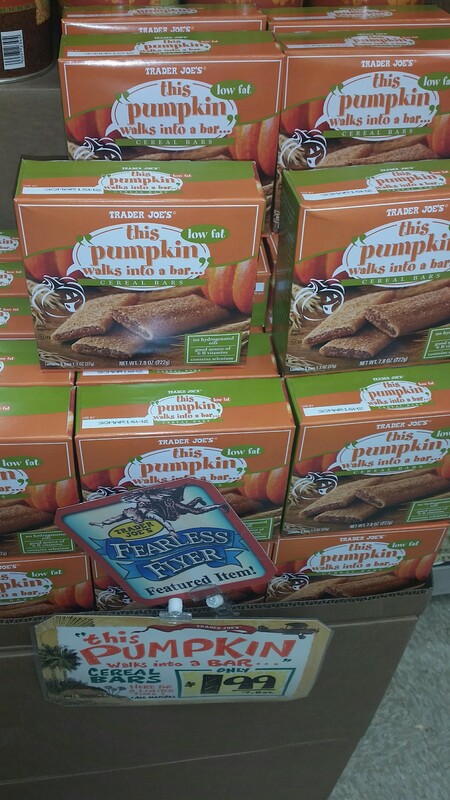 I have never been a pumpkin seed fan. 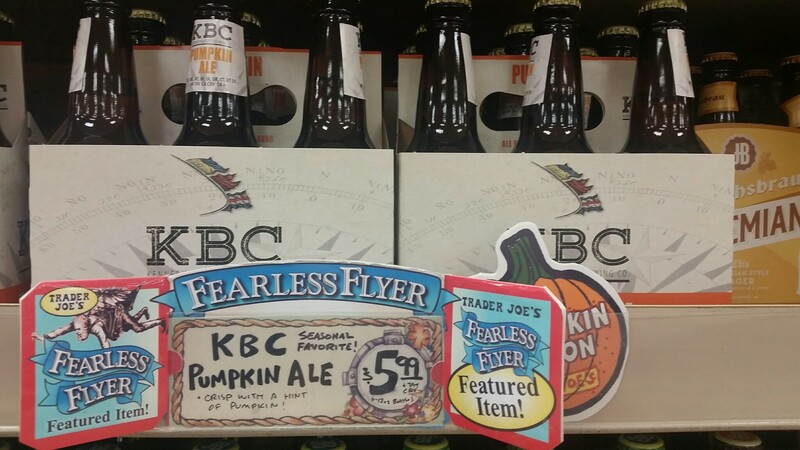 Ace Hard Pumpkin Cider & KBC Pumpkin Ale – Both of these are great! 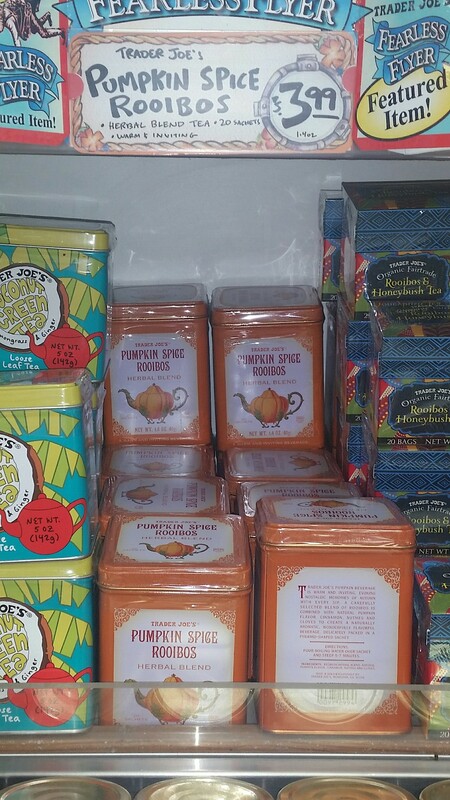 I tried the Pumpkin Cider recently at the Epcot Food and Wine Festival in Florida & was excited to find it! The cider is a bit sweet and the ale is not sweet. 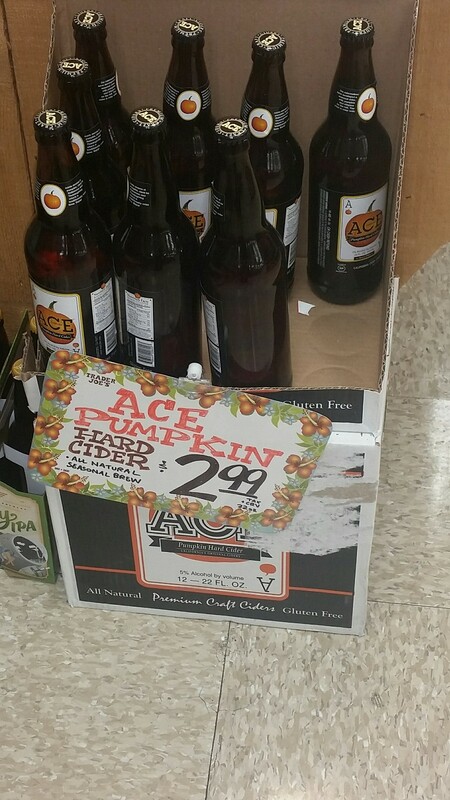 It just has a flavor of an essence of pumpkin. 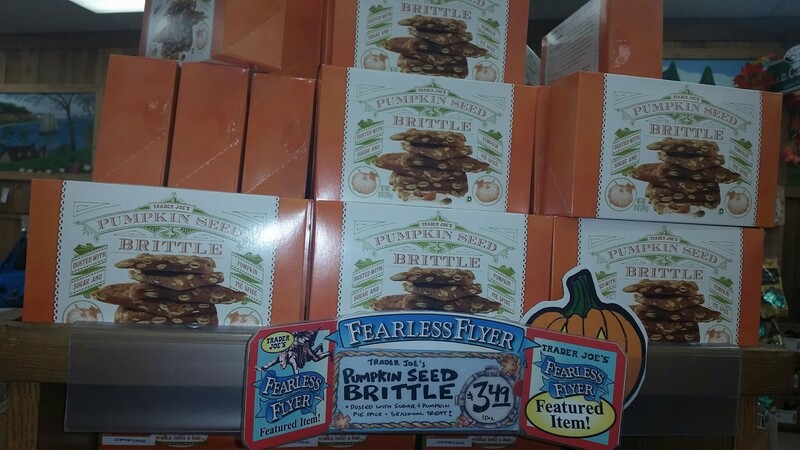 Pumpkin Seed Brittle – I have not tried, but I would try them, but as I said I am not a pumpkin seed fan, so this one could go either way for me. Pumpkin Butter – I bought this one last year for a variety of recipes throughout the season and it was delicious! See my kabocha squash recipe that utilized this pumpkin butter here –> KABOCHA SQUASH RECIPE. Dark Chocolate Pumpkin Spice Salted Caramels – I cannot even express how much I love these delicious morsels! As I said earlier, I savor them throughout the season, but this year they are going a bit too quickly and I may have to replenish them soon! These are a MUST TRY! 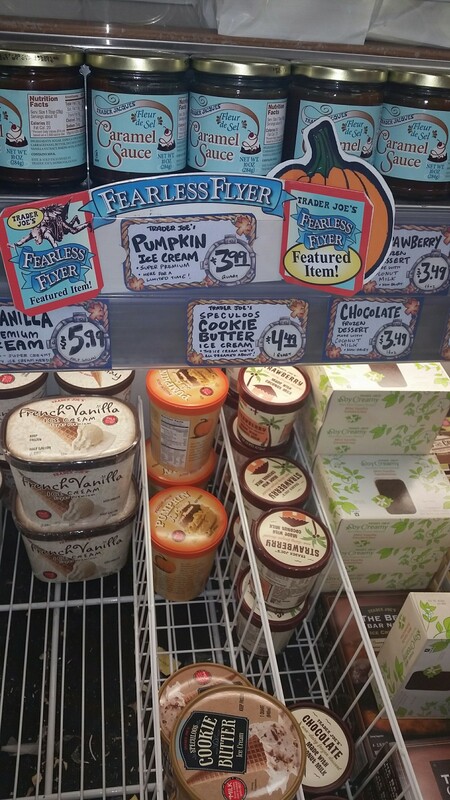 Pumpkin Ice Cream – I got this one last year! It is quite delicious, smooth and creamy. I love d this ice cream, however I did not finish the whole container because I got sick of pumpkin half way through the season and threw the remainder of it away which is why I chose not to buy it this year…I will buy this if I am making a dessert and sharing with others…the whole container is just a bit much for me. Ginger Pumpkin Ice Cream Cookie Sandwiches -While I have not personally tried these, one of my friends did and she has posted about them on facebook incessantly…she has an obsession and has bought several packages so I do plan to go back for this one! 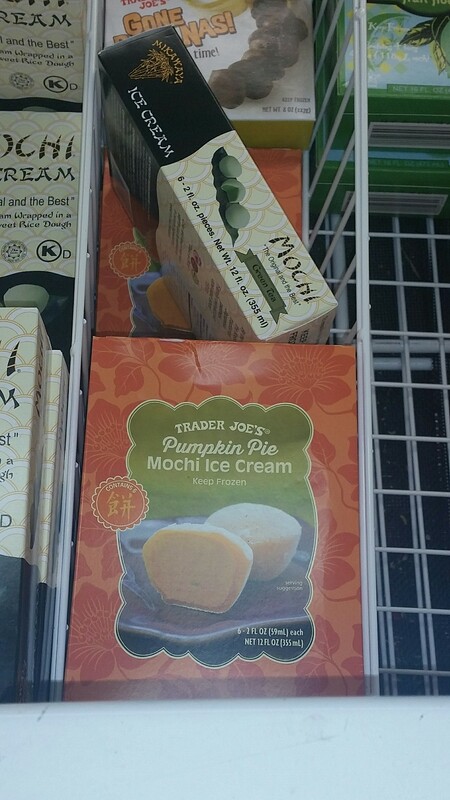 Pumpkin Pie Mochi Ice Cream – I am not a mochi fan and I did not purchase these, but my hubby is pretty upset I did not because he loves mochi, so we may head back for this one. 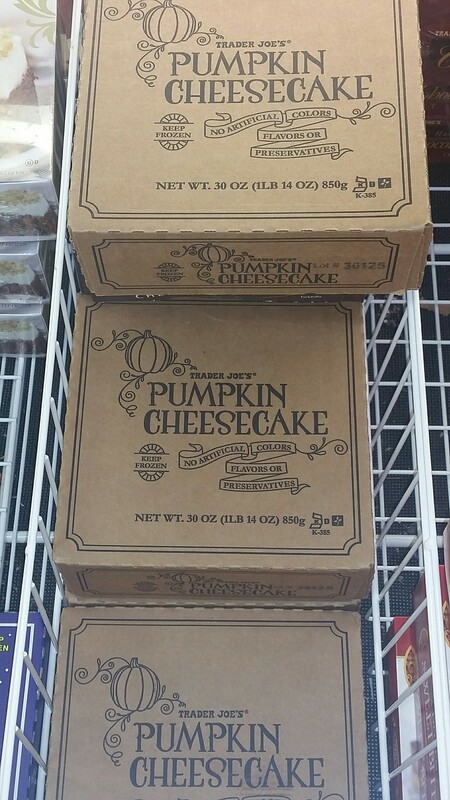 Pumpkin Cheesecake – I bought this one year and was addicted…I did not buy it in my last shopping trip, but I don’t think I will make it through the whole holiday season without the moist fresh goodness of the TJ’s pumpkin cheesecake…A MUST TRY! 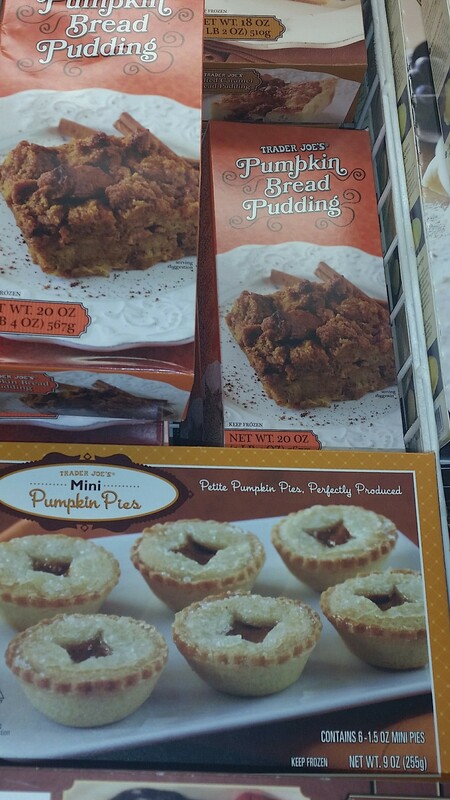 Pumpkin Bread Pudding and Mini Pumpkin Pies – While I have not yet tried the bread pudding, I did try the pies at my friends’ house and I could not stop eating them! I definitely recommend them…perfect flavor and so easy to eat!! Pumpkin Panettone – I have never been a fan of Panettone, so I do not plan to try this one. 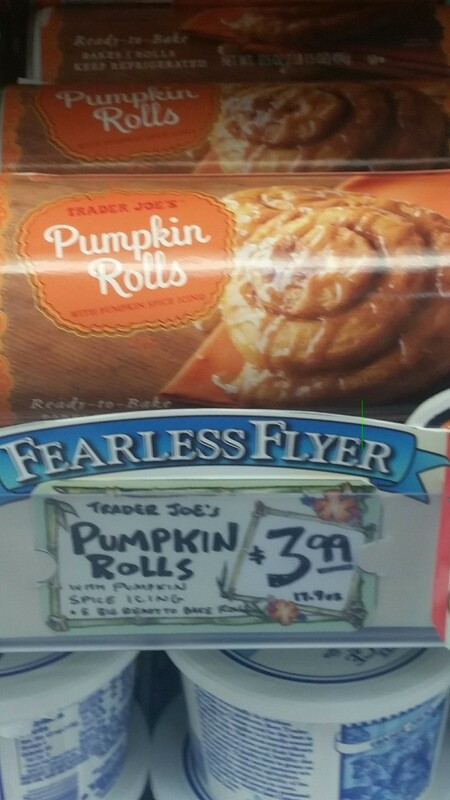 Pumpkin Rolls – I am really wishing I purchased these because one of my followers on Instagram shared with me her obsession about these rolls and how I must purchase them….so I will! Cannot wait to try! 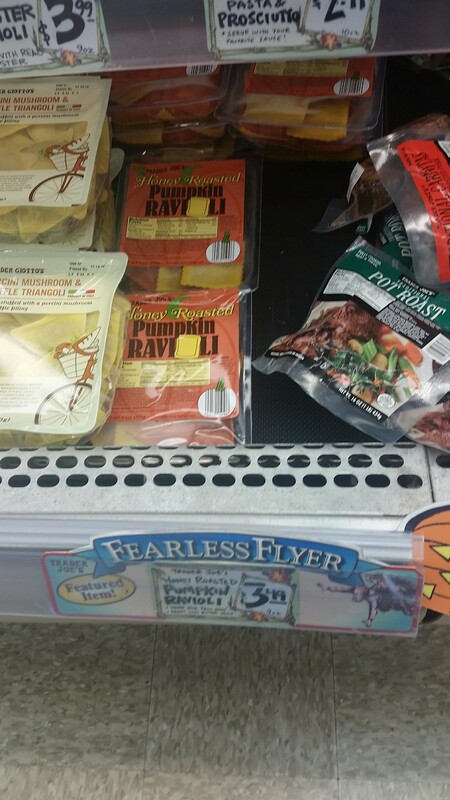 Pumpkin Ravioli – I did not get them because I already have way too much pasta, but I do hope to try them in the future. 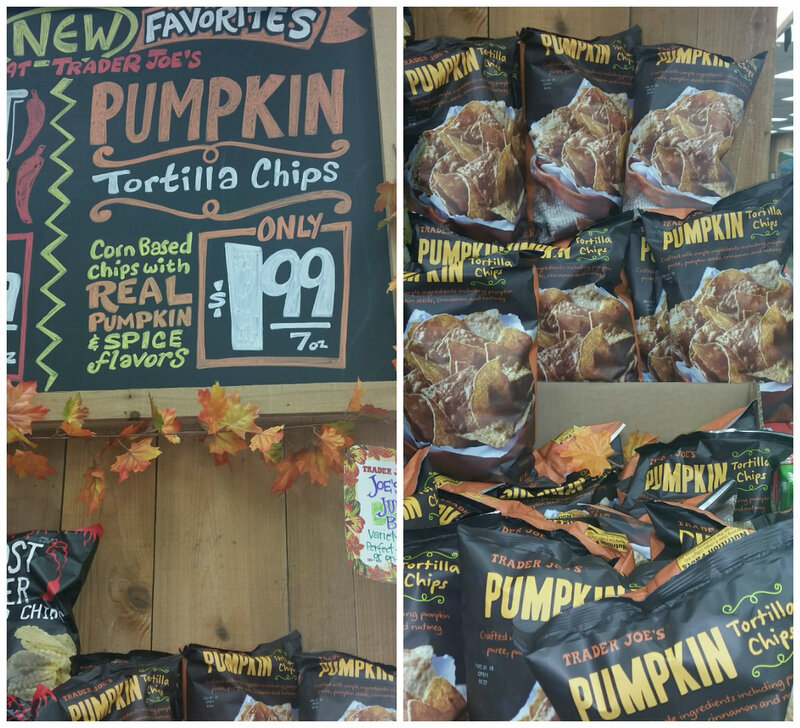 Pumpkin Tortilla Chips – I got these and we do like them! They are not sweet, but they have a definite pumpkin and nutmeg flavor to them! Have you tried any of the items above? 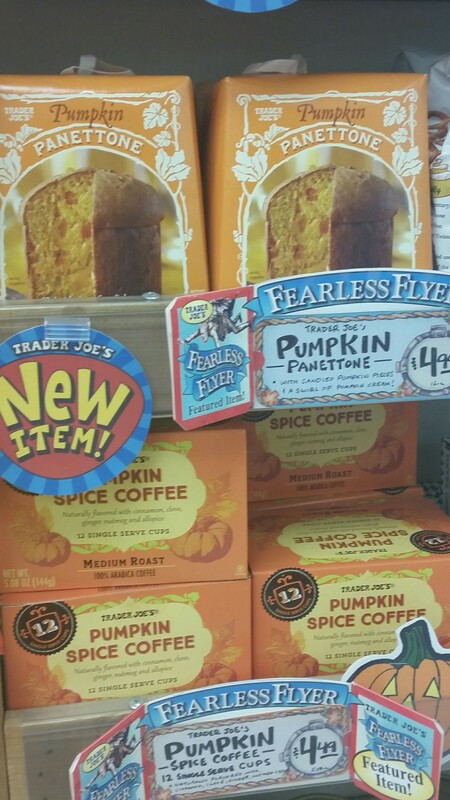 Please share about any Trader Joe’s pumpkin items you loved that I missed on my list above in the comments section! Happy fall!